Here is the original situation and the resolution. I just had a conversation with Mr. Gimbel to a) clarify exactly what happened; b) figure out how we can better protect creatives’ rights, and c) offer any assistance with b). I do intend to let this issue rest but had to clarify exactly what happened for avoidance of any speculation that might be damaging to any party involved. It turns out that there was no fraud at all; truth can be stranger than fiction. Here is the original situation. And here is the final development. Please note that comments in the original article are now closed. 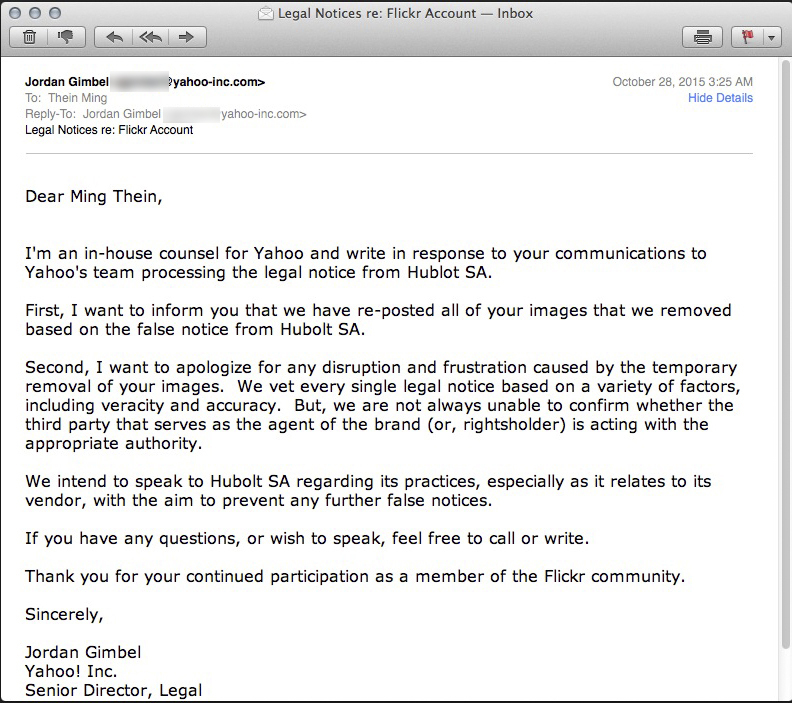 Yahoo’s counsel saying that my images have been reinstated, issuing an apology, and intent to follow up with Hublot. The images are back online, and the original post on Fratellowatches now works again. Today was not a good morning. 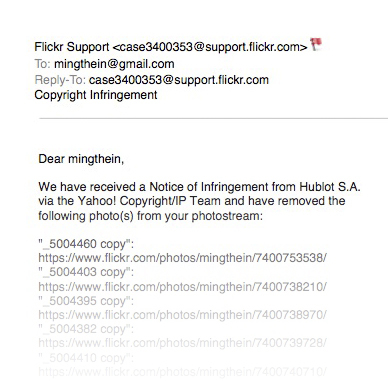 I woke up to the above email from Yahoo/Flickr stating that Hublot SA – a watch company – was claiming the rights to MY images – which were shot by me at an event for coverage for an online watch site in 2012. 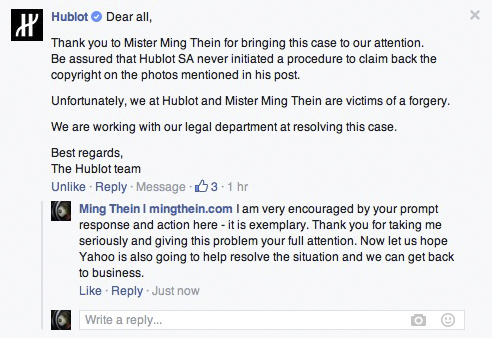 There was no contract with Hublot or its representatives, nor any embargoes. 1. Ethically, claiming rights for images that are not yours. That is outright theft. 2. Hoping that the photographer does not contest it because he does not have as deep pockets for lawyers as you do. 3. That Yahoo places the onus of proof on the copyright owner, not the claimant. I commend their speed of action (good for legitimate cases), but acting with only half of the information makes you just as guilty. 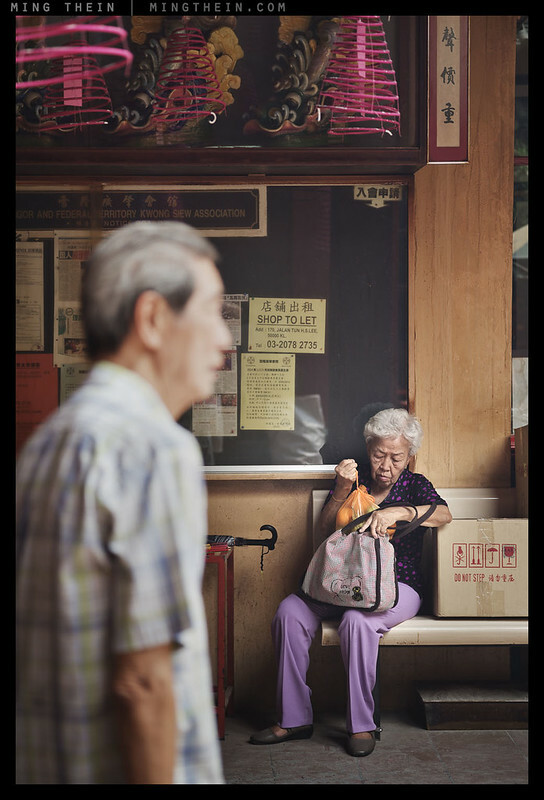 I’ve chosen this image to illustrate the article because although it may have commercial value to say, an old folks’ home, I cannot even let them use it for free because I do not have a consent release from the subjects. Yet it’s fine to use it for editorial – e.g. this article – because there is no commercial value derived, and I’m not promoting, selling or associating with any product. 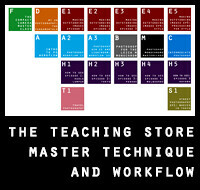 By showing it in more places, I’m also ensuring that more people will automatically be able to attribute the work to me. “Can I use your image for X? You’ll get credit as the photographer,” is probably something you’ve been asked more than once. How do you respond? How should you respond, from the point of view of something that works for both yourself and preservation of the industry as a whole? How do you ensure that your images are used in a way that you agree with, and with appropriate compensation? Read on. This article will be written mainly for the professional photographer trying to do two things: figure out the value of their images, and then protect it. d) The table with the apple on it was in a grocery store. Most people would take it in situation a); some might take it in situation b); and almost nobody in c) and d) because it would be outright theft. Simple, right? d) The image was on somebody else’s site with a watermark and ‘all rights reserved’ in the fine print. Not such a straightforward answer now, is it? For one, people tend to behave with much less regard and decency in the anonymity of the internet than in the real world. Images are intellectual property. This has monetary value, especially if you are a photographer; taking them without permission if you are not allowed to do so is plainly theft. The answer to the above dilemma is that only in situation a) would you be able to use the image without obtaining the image owner’s permission. b), c) and d) are all theft. However, most of the time asking nicely and offering credit is usually enough for the image owner to agree. After all, everybody knows that anything and everything put on the internet is fair game for viewing and public consumption. Returning to the fruit analogy, the problem comes when there’s nobody doing any policing; how many of you would still follow the law to the letter if you were almost certain you’d never get caught? The reality is that it’s impossible for a photographer to police their own IP on the internet; there’s simply no way to prove that an image hasn’t been used other than by seeing every single image on the web and coming to the conclusion that none of those images are yours. It gets even more complicated: although use of an image for any sort of use other than the license granted – and creative commons is the only license that lets you use an image without attribution (usually) for non-commercial purposes – is theoretically theft, there’s no point in following legal recourse if there’s no value to be gained. In such situations, the only people who win are the lawyers. Thus we are left with a perceptive difference – even amongst photographers – that ripping an image that’s not yours for editorial or blogging purposes isn’t as ‘bad’ as commercial use. True, but theft is theft – would it matter if somebody stole the apple to eat themselves or to sell on to somebody else? No. It doesn’t help that the majority of photographers are completely unaware of their own rights, and don’t bother issuing licenses or clear terms of engagement and usage conditions to clients or recipients of images; the problem here is that there’s now no way of proving whether the user of the image is a rightful licensee or not – such claims will be extremely weak in a court of law, because of the precedent that the photographer himself/ herself does not value their own images or intellectual property. There’s an obvious cascade here: If the photographer isn’t aware of their rights, and doesn’t stand up for them, how can they communicate that to clients or persons infringing? The answer is, they can’t. And you can be sure that nobody else is going to, because it simply isn’t in their best interests to do so. This results in a wide base of consumers of media who simply expect it to be free, and pout and lose their temper when they’re told it isn’t. I’ve recently had several cases of unauthorized image use – some on blogs, some editorial, and some commercial – not one single person bothered to have the simple courtesy to ask if they could use the images in question. I would have given permission for editorial use with attribution; for commercial use with licensing (if you’re using it to make money, it’s only fair that I should receive a license fee for helping you to do so). The most ignoble part of it was that in all cases, images were stripped from the server or screen capped, most of the time with the watermarks cropped out, and in some cases, manipulated to form horrible collages or crops – with the watermarks in. There’s another obvious problem with this: not only does it clearly demonstrate that all of the offenders knew what they were doing, but they also didn’t care. Do you think they would feel happy if somebody did the same to their content? Would they sit back and do nothing? I don’t think so, somehow. I put a lot of time and effort into creating content for this site – images, text, graphics etc – and it angers me when I see somebody else profiting off it without even the courtesy to ask permission. Only one apologized when confronted. The rest didn’t even respond, and will be the recipients of legal documents in short order. It gets worse: what if one of the images used without permission is used in a defamatory or negative way? 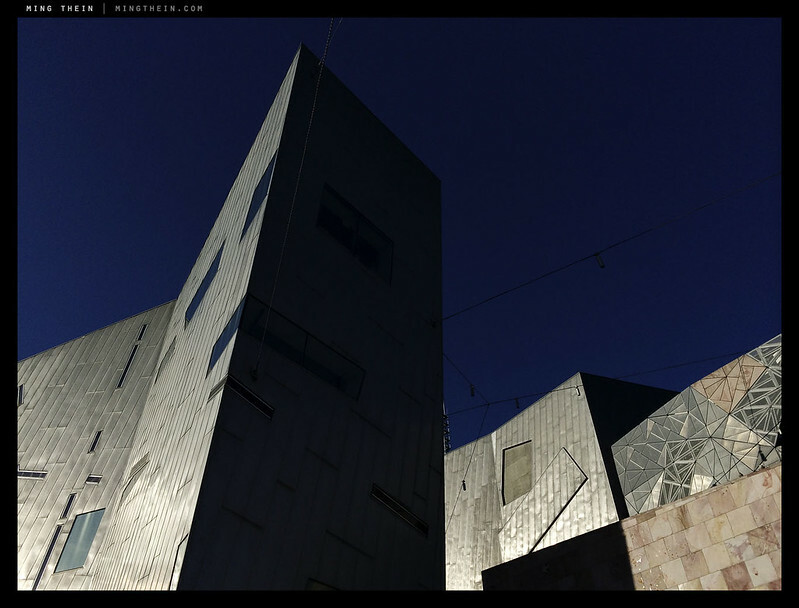 Or even displayed badly, but with the photographer’s watermark in place? The reputation of the photographer is on the line here – both professionally (what if influential people/ potential clients see the poor crops or presentations and make conclusions unfairly, leading to loss of business?) and legally – if used for defamatory purposes, the photographer can be liable – the onus of proof is on them to demonstrate that that was not the intention, and use was without permission. As with all demonstrations of negative proof, it’s extremely difficult to do and highly time consuming. You as a photographer have a responsibility to your own work and image to ensure that they are not used in a negative manner. This problem isn’t just limited to images – music, articles, writing, artwork – anything creative that can be easily replicated and distributed – is also fair game. The more effort required to produce something, the more likely the creator is to defend their rights – you can bet your bottom dollar that there will be almost no court cases involving camera phone images, but no end of those for piracy of big-budget movies. Simple rule: the more effort you have to put into creating something, the more value it should have – else economics simply don’t make sense. Speaking of economics, there’s a concerning trend here, too: free markets are dictated by willing buyer/ willing seller; prices fluctuate proportional to demand. If there are no or few willing payers for photography in today’s marketplace, what does that mean for the industry as a whole? Aside from the big budget productions that still require commissions, you can be sure that will translate not only into falling photographer rates, but also increasing image theft or copyright infringement. It’s happening already, and looking rather grim. 1. Do not use anybody else’s images without permission, except if the images are available under a creative commons license, and even then, only for non-commercial use. If you have used images in the past or are still using them, either remove them or seek permission from the owner of the image. Don’t forget to give credits. 2. Issue licenses to all users of your own images, that clearly state the parameters of use (consideration, applicable images/ file names, date and region of validity, permitted media) and some form of signed agreement. 4. Support photographers who are exercising their rights. If there is enough social pressure not to do something, it will reduce in prevalence and hopefully eventually cease. I want to finish this article by talking about a new act that’s coming into force affecting all Malaysians: Section 114A of the Evidence Act 1950, amendment passed April 2012. It’s the complete opposite of intellectual property rights: the implication is that we are now legally liable for every single distributed piece of information via whatever networked means we are deemed to control or have administration rights over, whether we posted it or not. If somebody hacks your site and posts a defamatory, libelious comment or something similar, you are responsible. If somebody leaks confidential information, you are responsible. If somebody uses your site, your devices, or even your internet connection, you are responsible – regardless of whether you did it or not, or whether you were a willing participant or not. Yes, that means if your laptop was stolen at gunpoint, then used to rob a bank, you are legally liable to be prosecuted for the bank robbery. The onus of negative proof is now on you, the site owner – and every good scientist will tell you, that’s impossible to do. Notably, the act does not cover copyright infringement – so that means you have no additional legal recourse if somebody decided to steal one of your images.